For those of you unfamiliar with this, it’s an idea from the Embroiderers’ Guild HQ, which many Guilds, including my own in Oswestry have taken up. Groups of six are chosen, and each group member is given an identical sketchbook. The first two pages are filled with your own ideas at which point books are passed on to the next in line in your group of six. Continuing with your initial ideas, fellow group members each add two more pages of inspiration. I love this idea! What a great way of sharing skills and a mutual passion. Here’s a couple of my pages. I am quite happy with the tools I have to hand but couldn’t resist buying a soldering iron when stitching friend, Dilys The Quilt, shared some new work. I haven’t quite figured out how I can make it work for me yet, but I’m having fun trying! I used it for the sketchbook page above (left) and the sample below. A big thank you to all those who attended my talk @ The North Wales Branch of the Embroiderers Guild last evening for such a wonderful welcome. 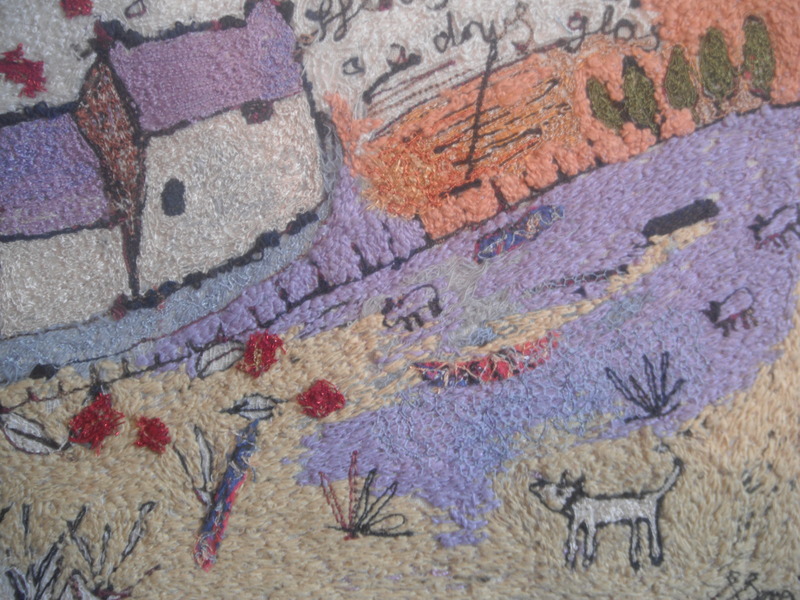 If you remember the story of the fox, missing chickens and wigwam , here is the very tale illustrated in stitch. Forthcoming Talks…On the 28th January, (which is only a week today!) I will be talking @ The North Wales Branch of The Embroiderers Guild, Rhos On Sea, and on the 8th January @ The Oswestry Branch of The embroiderers Guild. 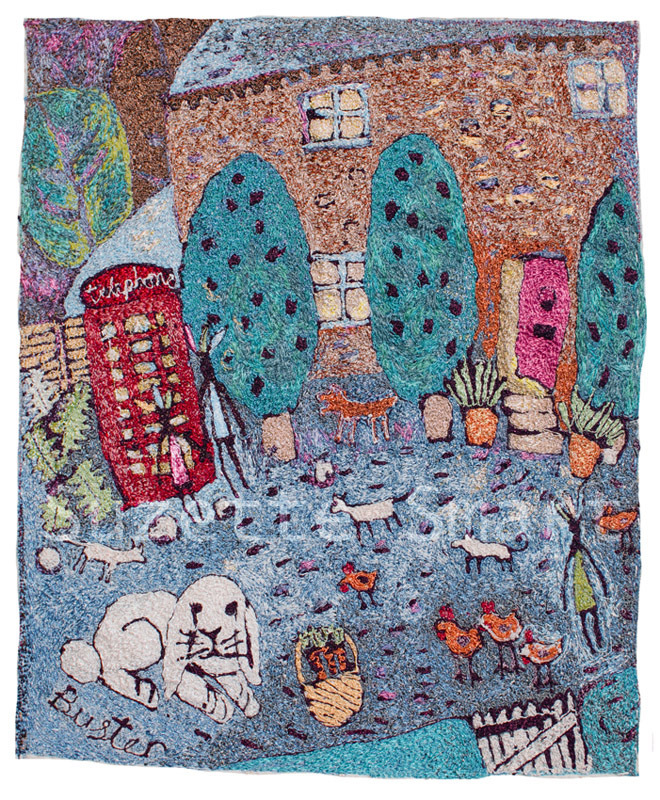 Also, Freehand machine embroidery Workshop on Saturday 16th February @ Castle Court Quilters, Whittington. 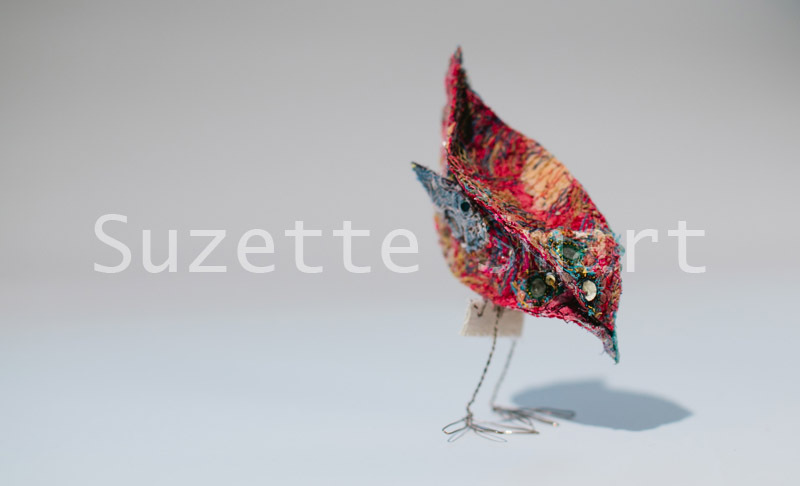 On Thursday the 6th September, you can find me talking @ Marches Branch of the Embroiderers Guild, Craven Arms. Lots of stitching tales to tell and show, including “let your happiness shine through”. 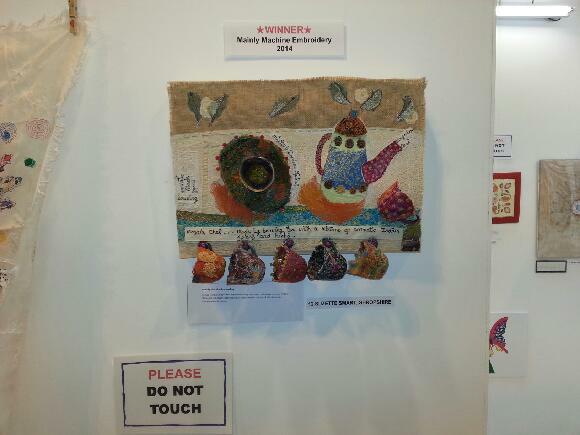 My most recent piece of work inspired and stitched for the Qube Open Art Exhibition (Oswestry) with the theme Celebrate. It goes on display this month through to the 30th October.